Wool carpet: Plush Flooring. Taping: Higher Ground. Floor paint: ‘Alabaster’ by Designers Guild. Dark paint: ‘Railings’ by Farrow & Ball. Wall paint: ‘Pure Brilliant White’ by Dulux. Bannisters paint: ‘Light Peachblossom 3’ by Little Greene. Light: £99, Made.com. Photographs: Christopher O’Donnell. 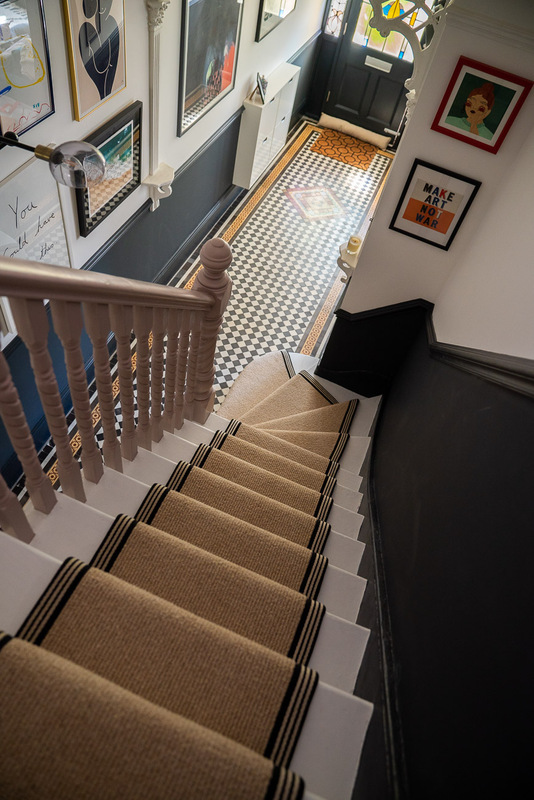 I was going to call this post ‘the truth behind stair runners’ but felt like it sounded a bit murder mystery for a blog post, but I really wanted to talk about the carpet specifically before I did a tour of the hallway. Mainly because: who knew a stair runner was so tricky?! I should probably start with why we wanted a stair runner. 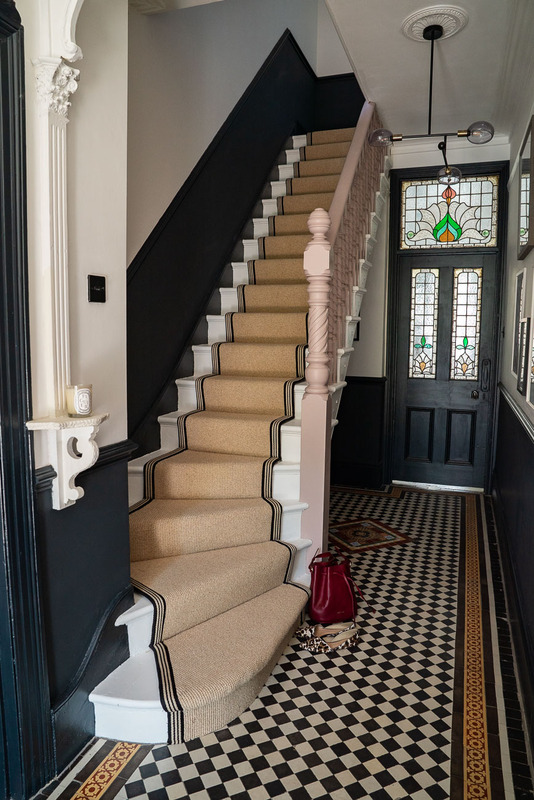 Firstly, we wanted carpeted stairs rather than wood as it feels safer underfoot and with Peggy’s eminent crawling/walking we wanted a safe environment for her (obviously we’ll be looking at stair gates, too! ), it’s the only part of the house with any carpet at all and we thought it would pull everything together. But we still wanted to tie in the original elements of the house, as we have tried to keep to its heritage as much as possible – so wanted to see the original floorboards (even if they were painted). We had a runner in our last flat which ran upstairs and loved it (see post here) and wanted to recreate it here, but as this hall gets no natural light we painted the floor underneath white (‘Alabaster’ by Designers Guild floor paint) to help bounce more light around. So you could say we knew what we wanted. 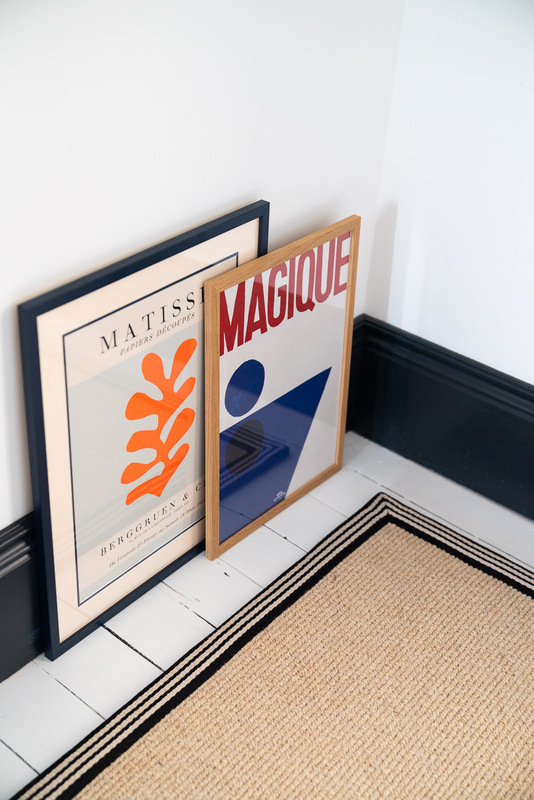 Matisse style print: Etsy. Hotel Magique print: Cissy Wears. Floor paint: ‘Alabaster’ by Designers Guild. Skirting board paint in Estate Egshell: ‘Railings’ by Farrow & Ball. Wall paint: ‘Pure Brilliant White’ by Dulux. But it turns out, carpets aren’t a ‘one size fits all’ scenario. Firstly, I didn’t realise than runners on a landing are quite rare and we were met with odd looks from carpet shops. 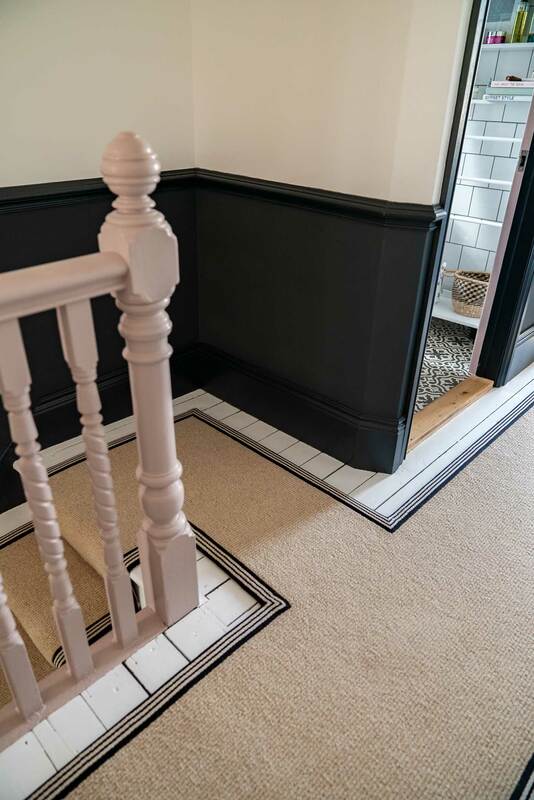 We’d only ever done this so found it quite unusual – apparently runners are popular on stairs and then the landing is carpeted, especially for tripping hazards (oops, sorry Peggy!). And if you want taping, it works out far more expensive than a carpeted landing (but you already know I don’t like to compromise). Next. We wanted Roger Oates carpet. I am a big fan of stripes, but after having the pinstripe in our last place I wanted something different – maybe herringbone? They had some amazing ones but we were quoted £7k-£8k, I’m not saying it’s not worth it but we didn’t have that lying around. As it was we had to sell a load of camera and electrical equipment to pay for the carpet we eventually went for (which came to around £1800 including taping and fitting). 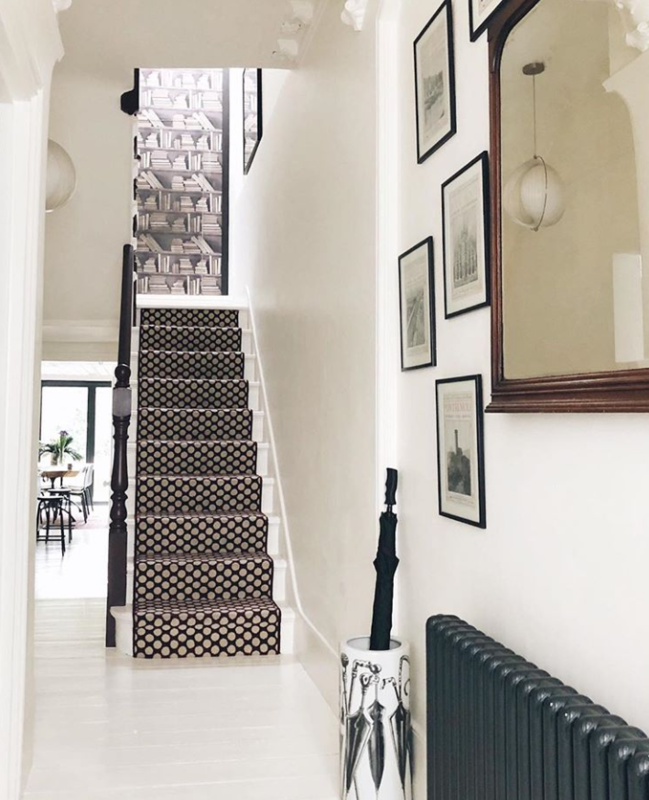 The amazing hallway was one of the reasons we fell in love with this house – the width, the feeling of space, the lovely turn at the bottom of the stairs, however, all of these factors mean that everything came in a lot more expensive. Our last runner in our flat cost £300 as we could buy a remnant for the not so large space (I would definitely recommend this if you have a smaller area to cover!). So we started looking again, back to stripes, but turns out you can’t really have striped carpet if you have a turn in your stairs because the joins wouldn’t match. It is possible, but they couldn’t guarantee it would look good, or as I imagined. I said ‘rubbish! I’ve seen it on Pinterest’ but when I held up the images, they were all Roger Oates carpets. Roger can do turns with stripes, clever old thing, because in fact it’s not really a carpet, it’s a weave so can be stretched around (why it’s so pricey – but according to sources, it is also very difficult to clean – trying to make myself feel better here). I have since found out that stairs at a right angle are easier (see Kate’s advice later), but turns are tricky…and then the guy in the carpet shop saw that we had a turn at the top of the stairs and then it split in two directions and he said no chance, we’d have to go for something simpler. So this is when we went for beige carpet. Never in my wildest dreams would I have thought I’d want beige carpets but sometimes? Practicality wins. I love our beige jute rug in our bedroom and the idea of sisal, but it felt a bit scratchy underfoot (and again, sisal is very hard with a turn! ), especially with Peggy crawling. 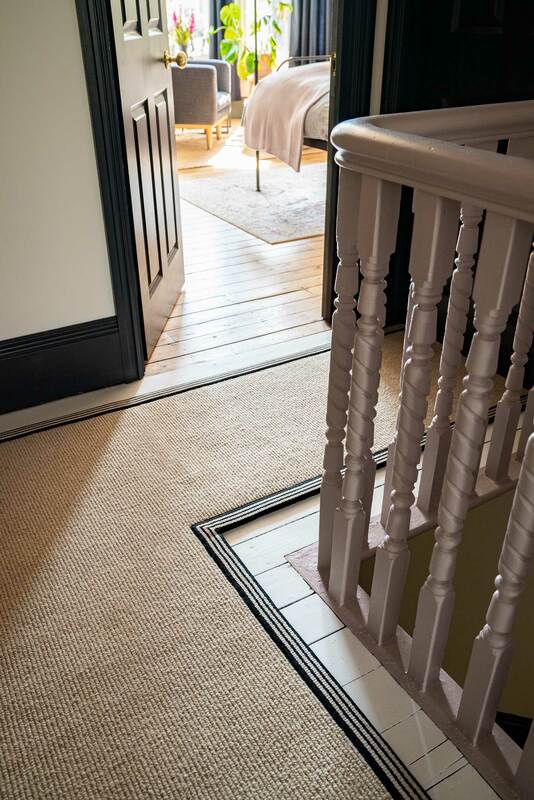 So we went for a wool carpet (this is actually Kersaint Cobb ‘Pampas Nordic’ via a local shop called Plush Flooring) that had the look and feel of sisal but was softer and long-lasting. And I learnt from Kate from Mad About The House lately that wool carpet is better for asthmatics as it traps dust, it can be recycled, plus it is naturally fire resistant. So there you go! Wool carpet: Plush Flooring. Striped taping: Higher Ground. But I still wanted something different and was missing the stripe in our hall. We knew we wanted taping on the edges, rather than whipping, mainly because we had it in our last place and loved it (and didn’t get to live with it long enough before we moved!). But again, most carpet shops only offer a few colours – black, grey or red if you’re lucky. There is far more choice of colours with whipping, however. It is important to point out that taping is pricey, it is what put the price of this carpet up – the edging is almost as much as the carpet itself. We knew this from our last flat but still wanted it. We left the carpet store a bit disappointed. As nice as grey edging would look, I had to at least see if there was another option. I went home and searched for hours on Google images and Pinterest (PRO tip: Pinterest is SO much better for these types of image searches as it’s a more creative space). I found loads of amazing images – tons of different taping options and even a STRIPE taping – but they were all US based sites. I even tried Etsy in the hope of sourcing my own taping! No luck. On Chris’s search, he found one shop who did loads of different taping but you had to also purchase the carpet (and guess what? They were more spenny), and then he remembered he used to work in a carpet shop for his first Saturday job so called up the store (Higher Ground) for their advice, maybe they had a contact they could pass on? Turns out, they sold stripe taping no problem, sent us some images and they had what we wanted!! We called Plush Flooring and asked if it was possible to bring in our own taping and add to their carpet and they agreed to do it for us. We were almost there. This hall has taken almost 2 years of solid work now, and we have been painting most nights to get it ready, so I just didn’t want to compromise on how we wanted it after all the sweat and tears! 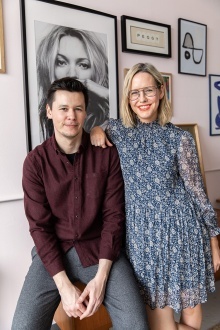 That’s the one big piece of advice I would give: it’s your house, you have to live in it, so don’t let shops tell you how things ‘should’ be done if you think there might be another way of making what you want work. With the fitting, we were told our hall was the trickiest the fitter had seen! Great. But he did a superb job. The only problem was: yes, you guessed it, the blimmin’ turn! 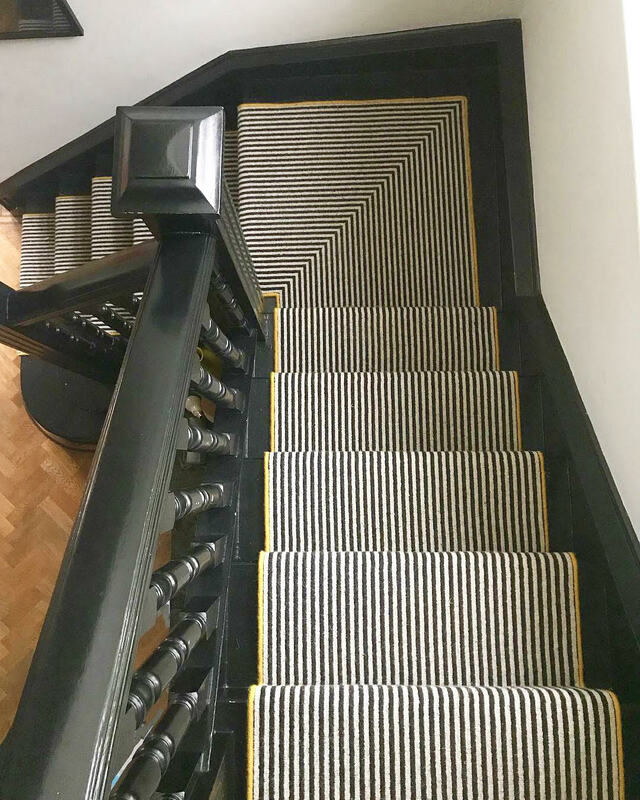 The carpet fitter wanted to cut the carpet so that it was the same length all the way down, which just didn’t make sense when the steps themselves were bigger, and he also suggested on the final step it finish as a straight line, rather than curve the same way as the step. I really pushed for this, we worked through it together and I am so happy with how they turned out. Yes, we do have a few more paint touch-ups after the glue has been sprayed! So that’s the longest story in the history of the world about a stair runner. Hope you stuck with me and it offered some food for thought! 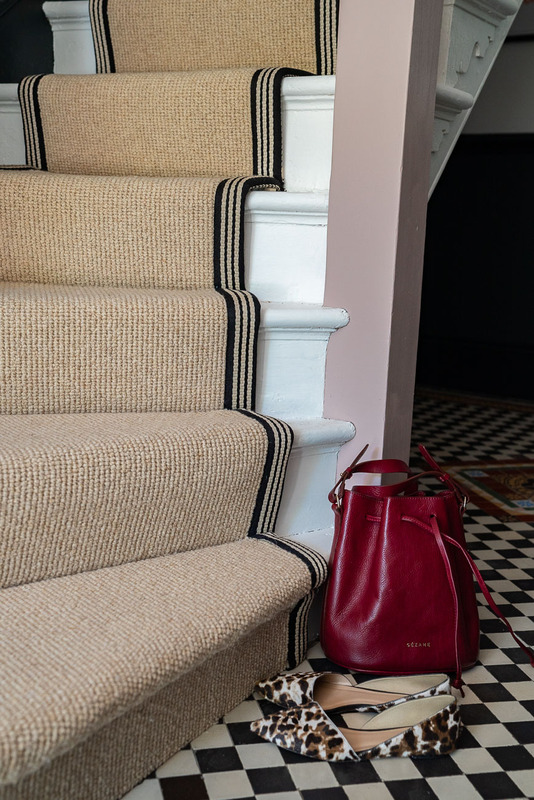 I also wanted to share an image of how to do a stripe stair runner right when you have a 90 degree angle on your stairs, let Kate from Come Down To The Woods show us all how it’s done (and she has shared her top tips on runners below, too!). If your stairs do more turns than a ballerina, don’t stress. There will always be a way to make your perfect carpet work. Do your research and save images that you love. It’s always helpful showing your fitter exactly what has inspired you, they may never have seen it before. Don’t be afraid to go bold on the stairs. A carpet can make as much impact as a piece of art. They are often the first thing that you see when you enter a house, make them a taste of what your home has to offer. 3. Light or Dark side? Stairs are tricky, too light and it will show marks and too dark will show up lint. A pattern will help to hide any marks or dirt. If you decide on a plain carpet a medium tone will work the best. One of my favourite designs to use on the stairs. Perfect if you want to make a statement but are a little more reserved. Stripes will give the feeling of flow from floor to floor and the choice is vast from bold to neutrals. As a rule, the more turns that your staircase have, the narrower the stripe, its much easier to hide the discrepancies with a smaller stripe. If choosing a stair runner, the edges will need to be whipped to prevent fraying. Consider making a statement with your whipping. Use the whipping to add personality to your runner, a bold choice will make the carpet really pop. Alternatively borders can be added. This is a great opportunity to explore not only contrasting colours but also differing textures. Leather, cotton, suede, jute or hessian could be used to add depth. 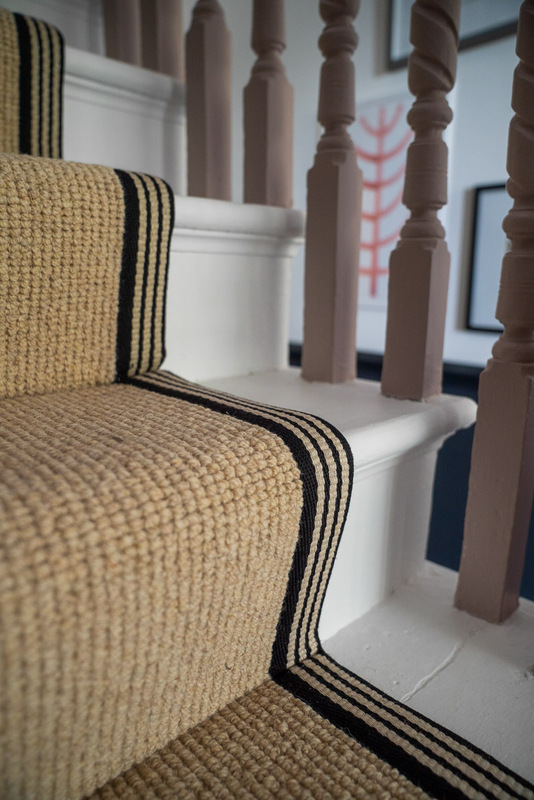 Kate from Mad About The House’s wool stair runner. Follow Kate on Instagram here. 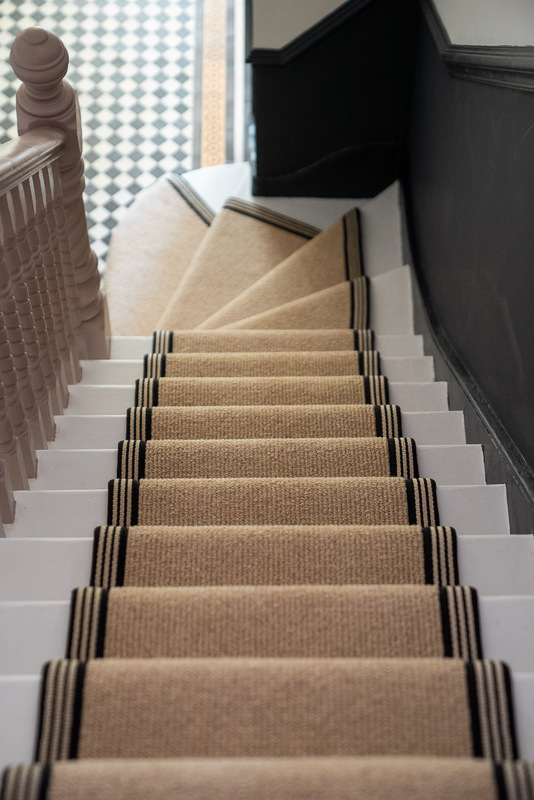 I always advise wool for stair runners as its the easiest material to clean and most durable, which is very important when you have children, and a lot of foot-flow up and down the stairs daily! 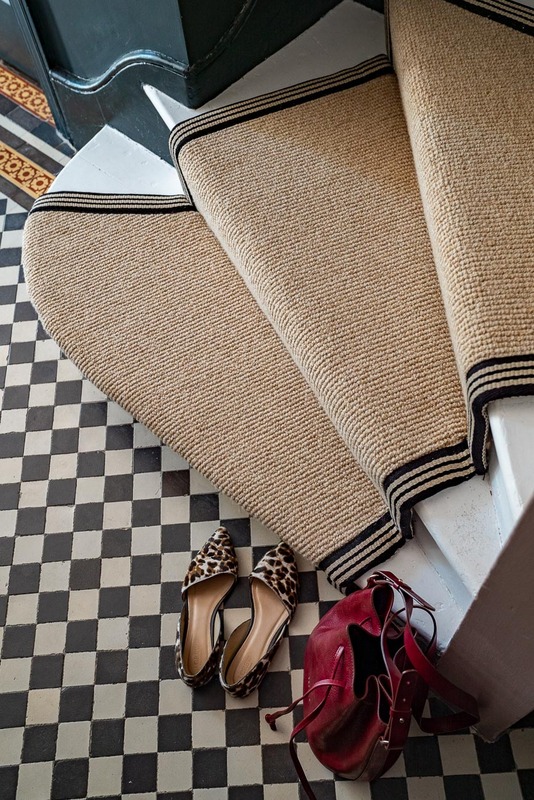 Sisal is also a great alternative if you’re looking for a more natural look, but make sure that you choose a colour and design that has a lot of striation (linear marks) so that any marks or spillages can be disguised as unfortunately it is very difficult to clean! But don’t be put off, as once fitted in a home it looks very beautiful and is one of my favourite looks. I love a colourful runner and there are so many beautiful options out there to choose from making it extremely accessible to everyone (and their budget!). As stairs are usually only small portion of the house you can absolutely afford to use colour here without it becoming too overwhelming. Stairs are also usually the first thing you see upon entering so I always think it’s nice to have an inviting runner to lead you through the house! 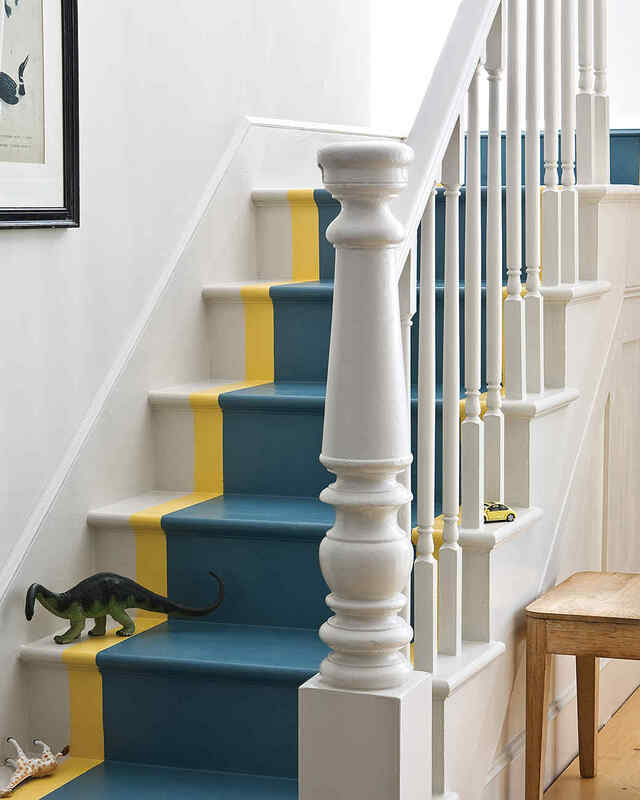 Painting a runner through the house you will get same affect but at a significantly cheaper cost, or depending on your taste you could paint the stair risers another colour to be a bit different. I’ve seen some wonderful examples over the years which have inspired me to do at my own home and projects I’ve worked on! You can also follow my Pinterest page, with a lot of my interiors inspiration here. We put wool carpet in our stairs 8 years ago , it has now worn out on some edges so time to replace . I wanted a runner last time but with two landings off it , I came unstuck, no carpet shop being able to do a look I imagined . It drove me potty. This time I will endeavor to win ! Your staircase is a triumph. You can tell how much time and love went into it. You were absolutely right to hold your ground on the turn at the bottom too. Brilliant useful post too, we will be doing our stairs next year so I will refer back to this! Stunning & worth it! Admire your tenacity! Your use of colours is absolutely splendid! Another thing I’d recommend considering if putting wool carpet in an old house (Victorian/Edwardian etc) is to buy one that has been treated to be moth proof! We are currently taking up wool carpets which are home to moth eggs and larvae (eurgh!) especially in the stair treads, and despite repeated treatments. I’m going for a mothproofed wool blend in its place to try to finally beat them…. fingers crossed. Oh yes, great tip – hope ours is ! !